The Center is proud of the many accomplishments of the students and staff at CMU-authorized charter public schools. The work they are doing every day is preparing them for success in college, work and life. CMU-authorized charter public schools are seven of the top 25 performing charter public schools in the state based on 2018 M-STEP results. 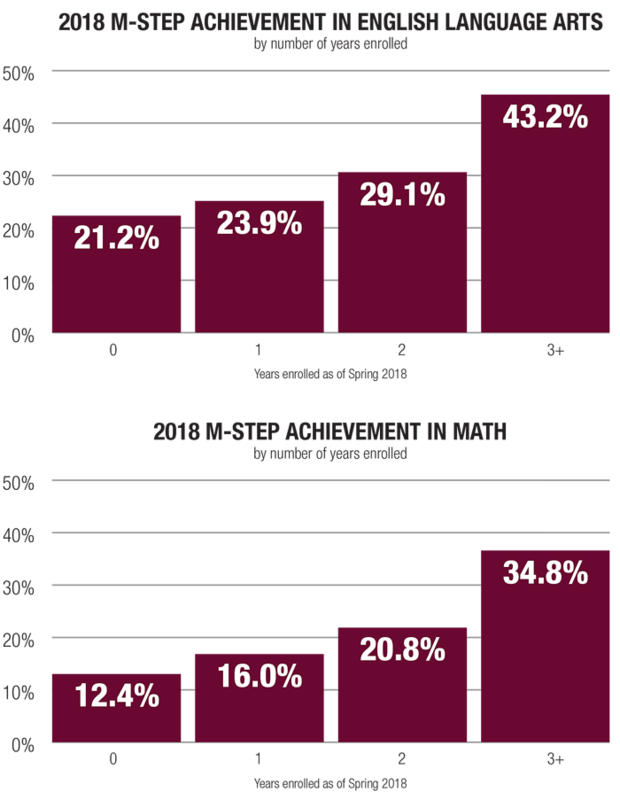 The longer students are enrolled in a CMU-authorized charter public school, the higher their rates of proficiency are in English language arts and math in grades three through eight for the 2018 M-STEP test. There is a tradition of excellence with award-winning leaders serving the students in CMU-authorized charter public schools. Our schools had two teachers recognized as finalists for the 2018 Michigan Charter School Teacher of the Year award. Schools represented in this group of finalists are Trillium Academy and Woodland Park Academy.